This topic will be oriented toward techniques which can be used to interpret nondestructive testing, NDT, data from the Falling Weight Deflectometer, FWD. There are all kinds of NDT data which can be collected on or about pavements but concentration is placed on measured surface deflections. This article is separated into three broad themes: (1) an introduction, (2) indices for project analysis, and (3) fundamentals of backcalculation. The introduction will start with an overview of some of the deflection basic parameters that have been used in the past; although, some of the NDT equipment noted is rarely used today (such as the Dynaflect). This is followed by a discussion of some easy to use models to predict layer moduli that were developed by the University of Washington for the Washington State DOT (WSDOT). A short discussion on AASHTO developed models follows along with some of the work done in South Africa and companies such as the Shell Oil Co. The second theme will cover basic parameters which can be quite useful in analyzing existing pavement structures. The last theme focuses on the basics associated with backcalculation of layer moduli. These basics do not rely on specific software but do largely involve layered elastic analysis. Over the years numerous techniques have been developed to analyze deflection data from various kinds of pavement deflection equipment. A fairly complete summary of deflection basin parameters was provided by Horak at the Sixth International Conference Structural Design of Asphalt Pavement [Horak, 1987] and is shown in Table 1. Plate or center load deflection which represents the total defection of the pavement. This was obviously the first deflection parameter which came with the Benkelman Beam. It has been used for many years as the primary input for several overlay design procedures. The slope or deflection differences close to the load such as Radius of Curvature (R), Shape Factor (F1), and Surface Curvature Index (SCI). These parameters tend to reflect the relative stiffness of the bound or upper regions of the pavement section. The slope or deflection differences in the middle of the basin about 11.8 in. (300 mm) to 35.4 in. (900 mm) from the center of the load. These parameters tend to reflect the relative stiffness of the base or lower regions of the pavement section. The deflections toward the end of the basin. Deflections in this region relate quite well to the stiffness of the subgrade below the pavement surfacing. The subsequent parameters to be presented were developed to provide a means of obtaining the resilient modulus values of the surfacing layers more easily or quickly than full backcalculation. In general, the success of these regression equations to predict the resilient modulus of the surfacing layers has been limited. There is a clear consensus, however, that the deflections measured beyond the primary effects of the load stress bulb relate quite well to the resilient modulus of the subgrade. 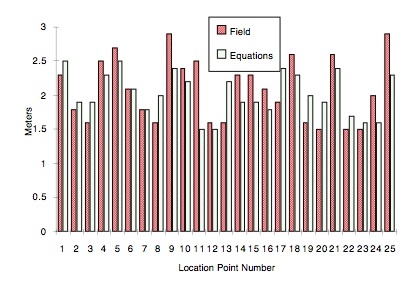 The R2 ≈ 99% for all equations and the sample sizes were 180 (two layer case) and 1,620 (three layer case). r = distance from the load to Dr (in.). Using an Sf value of 0.2892 where the Poisson’s ratio is 0.40, the equation reduces to the following equations for deflections measured at 2 ft (610 mm), 3 ft (914 mm), and 4 ft. (1,219 mm). In the AASHTO Guide, detailed procedures are provided to insure that the deflections used to determine ESG are outside the pressure bulb from the test load. To most accurately represent the subgrade stiffness; however, the deflections closest to the load without being directly effected by the pressure bulb should be used. Stiff underlying layers will have the greatest effect on deflections furthermost from the test load. For example in cases where total surfacing depths are around 11.8 in. (300 mm), deflections taken around 23.6 in. (600 mm) should be used to determine ESG. r = distance from center of load plate to Dr (inches). MR = backcalculated subgrade resilient modulus. For “thin” pavements (such as Section A, Figure 3), ae ≈ 15 in. 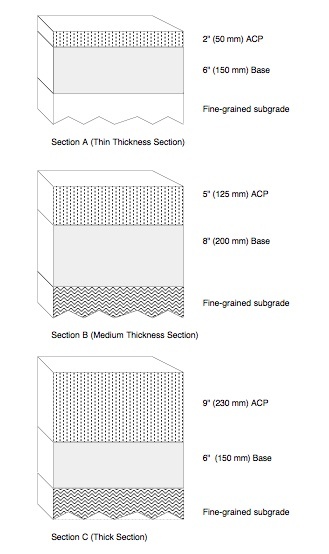 ; “medium” to “thick” pavements (Sections B and C, Figure 3), ae ≈ 26 to 33 in. Thus, the minimum r is usually 24 to 36 in. (recall r > 0.7 (ae)). δ2000 = deflection at a distance of 2000 mm from the (point) of loading (µm). Table 4 is used to show typical subgrade moduli as listed by Chou et al. [1989]. Note: Limited to fine-grained soils with a CBR of 10 or less. 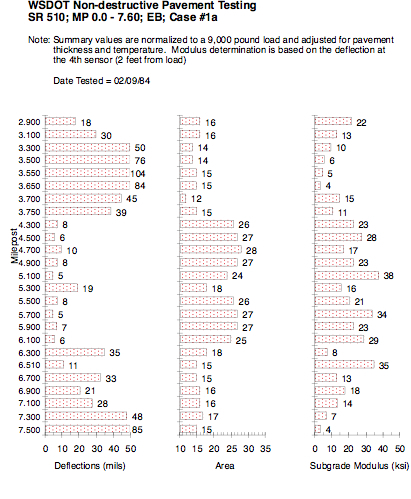 The granular base modulus is a function of the subgrade modulus and base course thickness. Asphalt stabilized materials: use information available for asphalt concrete. Lime-stabilized materials: a modulus range of 100,000 to 1,000,000 psi (690 to 6,895 MPa) is suggested. Cement stabilized materials: a range of 300,000 to 4,000,000 psi (2,070 to 27,600 MPa) is suggested. Absolute minimum and maximum values for AC are 50,000 to 2,000,000 psi (345 to 13,790 MPa). Pac = asphalt content, by weight of mix. Over the years it has found that the use of selected indices and algorithms provide a “good picture” of the relative conditions found throughout a project. This picture is very useful in performing backcalculation and may at times be used by themselves on projects with large variations in surfacing layers. WSDOT is currently using deflections measured at the center of the test load combined with Area values and ESG computed from deflections measured at 24 in. 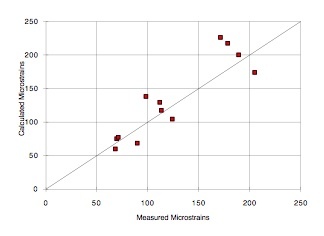 (610 mm) presented in a linear plot to provide a visual picture of the conditions found along the length of any project (as illustrated in Figure 1). The Area value represents the normalized area of a slice taken through any deflection basin between the center of the test load and 3 ft (914 mm). By normalized, it is meant that the area of the slice is divided by the deflection measured at the center of the test load, D0. Thus the Area value is the length of one side of a rectangle where the other side of the rectangle is D0. The actual area of the rectangle is equal to the area of the slice of the deflection basin between 0 and 3 ft (914 mm). D3 = surface deflection at 3 ft (914 mm). D900 = deflection at 900 mm. Figure 2 shows the development of the normalized area for the Area value using the Trapezoidal Rule to estimate area under a curve. h = common distance between chords. Thus, since we normalized by D0, the Area Parameter’s unit of measure is inches (or mm) not in2 or mm2 as one might expect. Then, Area = 6(1 + 2 + 2 + 1) = 36.0 in. The minimum Area value should be no less than 11.1 in. (280 mm). Area = 6(1+ 2(0.26) + 2(0.125) + 0.083) = 11.1 in. Further, this value of Area suggests that the elastic moduli of any pavement system would all be equal (e.g., E1 = E2 = E3 = …). This is highly unlikely for actual, in-service pavement structures. Low area values suggest that the pavement structure is not much different from the underlying subgrade material (this is not always a bad thing if the subgrade is extremely stiff — which doesn’t occur very often). 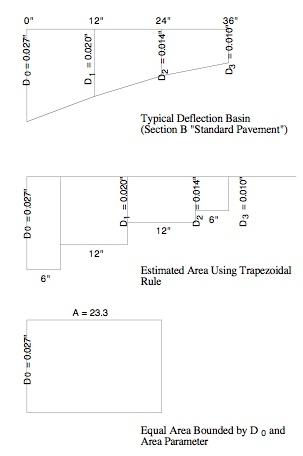 Typical Area values were computed for pavement Sections A, B, and C (Figure 3) and are shown in Table 5 (along with the calculated surface deflections (D0, D1, D2, D3)). Table 6 provides a general guide in the use of Area values obtained from FWD pavement surface deflections. For Figure 3, the initial layer moduli are HMA = 500,000 psi, crushed stone base = 25,000 psi, and fine-grained subgrade = 7,500 psi. A method which has received extensive development work is the “backcalculation” method. 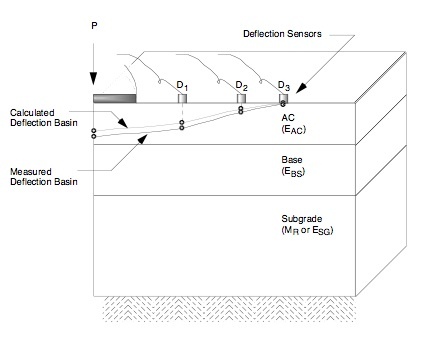 This is essentially a mechanistic evaluation of pavement surface deflection basins generated by various pavement deflection devices. Backcalculation is one where measured and calculated surface deflection basins are matched (to within some tolerable error) and the associated layer moduli required to achieve that match are determined. The backcalculation process is usually iterative and normally done with software. An illustration of the backcalculation process is shown in Figure 4. 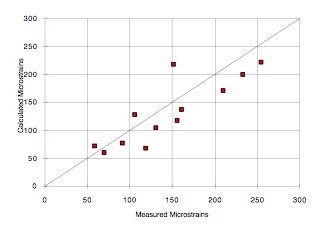 Measured deflections – Includes the measured pavement surface deflections and associated distances from the load. Layer thicknesses and loads – Includes all layer thicknesses and load levels for a specific test location. Seed moduli – The seed moduli are the initial moduli used in the computer program to calculate surface deflections. These moduli are usually estimated from user experience or various equations. Deflection calculation – Layered elastic computer programs are generally used to calculate a deflection basin. Error check – This element simply compares the measured and calculated basins. There are various error measures which can be used to make such comparisons (more on this in a subsequent paragraph in this section). Search for new moduli – Various methods have been employed within the various backcalculation programs to converge on a set of layer moduli which produces an acceptable error between the measured and calculated deflection basins. Controls on the range of moduli – In some of the backcalculation programs, a range (minimum and maximum) of moduli are selected or calculated to prevent program convergence to unreasonable moduli levels (could be too high or low). The primary measure of convergence will be Root Mean Square (RMS) or Root Mean Square Error (RMSE) and is used in the EVERCALC program. Both terms are taken to be the same. nd = number of deflection sensors used in the backcalculation process. Generally an adequate range of RMS is 1 to 2 percent. Research provided at least two approaches for estimating the depth to stiff layer [Rohde and Scullion, 1990; Hossain and Zaniewski, 1991]. The approach used by Rohde and Scullion [1990] will be summarized below. 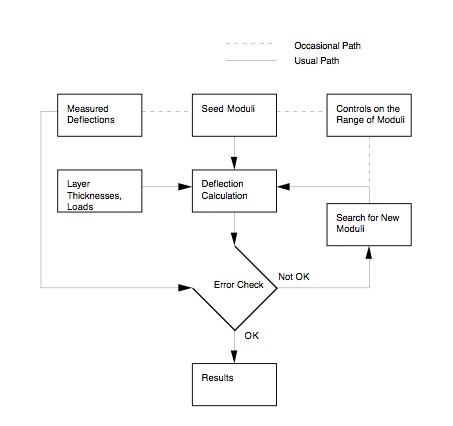 There are two reasons for this selection: (1) initial verification of the validity of the approach is documented, and (2) the approach is used in MODULUS and EVERCALC — backcalculation programs widely used in the U.S.
A fundamental assumption is that the measured pavement surface deflection is a result of deformation of the various materials in the applied stress zone; therefore, the measured surface deflection at any distance from the load plate is the direct result of the deflection below a specific depth in the pavement structure (which is determined by the stress zone). This is to say that only that portion of the pavement structure which is stressed contributes to the measured surface deflections. 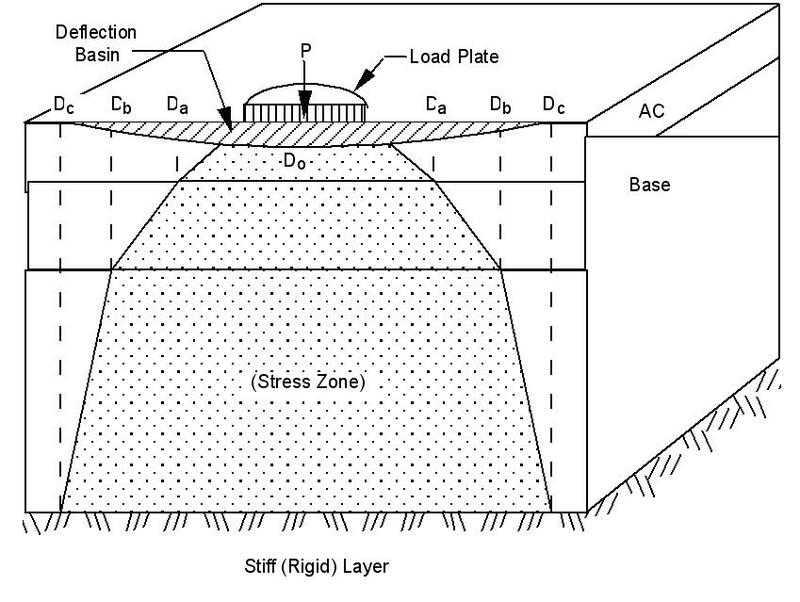 Further, no surface deflection will occur beyond the offset (measured from the load plate) which corresponds to the intercept of the applied stress zone and the stiff layer (the stiff layer modulus being 100 times larger than the subgrade modulus). 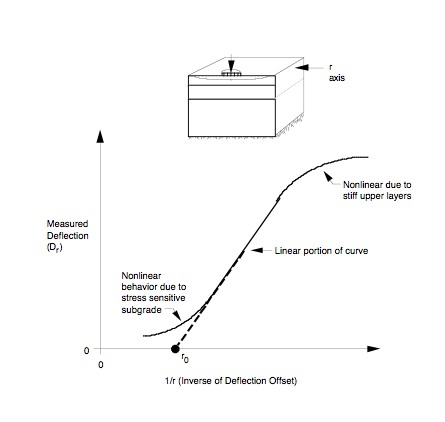 Thus, the method for estimating the depth to stiff layer assumes that the depth at which zero deflection occurs (presumably due to a stiff layer) is related to the offset at which a zero surface deflection occurs. This is illustrated in Figure 6 where the surface deflection Dc is zero. B = depth of the rigid (stiff) layer measured from the pavement surface (ft). The resulting regression equations follow in (b). Four separate equations were developed for various HMA layer thicknesses. The dependent variable is 1/B and the independent variables are r0 (and powers of r0) and various deflection basin shape factors such as SCI, BCI, and BDI. 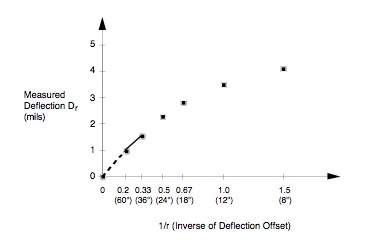 Di = surface deflections (mils) normalized to a 9,000 lb (40 kN) load at an offset i in feet. Use typical deflection data to estimate B (depth to stiff layer). The drillers log suggests a stiff layer might be encountered at a depth of 198 in. (5.0 m). (i) First, calculate normalized deflections (9,000 lb (40 kN) basis). This values agrees fairly well with “expected” stiff layer conditions at 16.5 feet (5.0 m) as indicated by the drillers log even though the 1/r value equaled zero. This road located in south central Sweden is used to illustrate calculated and measured depths to stiff layers (the stiff layer apparently being rock for the specific road). The depth to stiff layer was measured using borings (steel drill) and a mechanical hammer. The hammer was used to drive the drill to “refusal.” Thus, the measured depths could be to bedrock, a large stone, or hard till (glacially deposited material). Further, the measured depths were obtained independently of the FWD deflection data (time difference of several years). A KUAB 50 FWD was used to obtain the deflection basins. All basins were obtained within ± 5 m (16 ft) of a specific borehole. The deflection sensor locations were set at 0, 200, 300, 450, 600, 900, and 1200 mm (0, 7.9, 11.8, 17.7, 23.6, 35.4, and 47.2 in.) from the center of the load plate. The equations described in Section 3.3.4 were used to calculate the depth to stiff layer. Since the process requires a 9000 lb (40 kN) load and 1 ft (305 mm) deflection sensor spacings, the measured deflections were adjusted linearly according to the ratio of the actual load to a 9000 lb (40 kN) load. The results of this comparison are shown in Figure 9. Given all the uncertainties concerning the measured depths, the agreement is quite good. There have been and, undoubtedly, will be a number of attempts to verify that backcalculated layer moduli are “reasonable.” One way to do this is to compare measured, in-situ strains to calculated (theoretical) strains based on layered elastic analyses. Figures 10 and 11 show the measured and calculated strains in the two horizontal directions at the bottom of the AC layer (longitudinal and transverse). This specific testing was conducted during February 1993. In general, the agreement is good. The second study was reported by Lenngren [1990]. That work was conducted for RST Sweden and used backcalculated layer moduli (from a modified version of the EVERCALC program) to estimate strains at the bottom of two thicknesses of HMA (3.1 and 5.9 in. thick). The pavement structures were located in Finland. Tables 10 and 11 are used as summaries. The backcalculated strains are generally within ± 5 percent of the measured strains.